Also, if you are a first time visitor, or not familiar with the site, you will find a great deal of information on this page. If you are familiar with the site, you will probably find you can get where you wish quicker with the WEBSITE PAGE DIRECTORY. 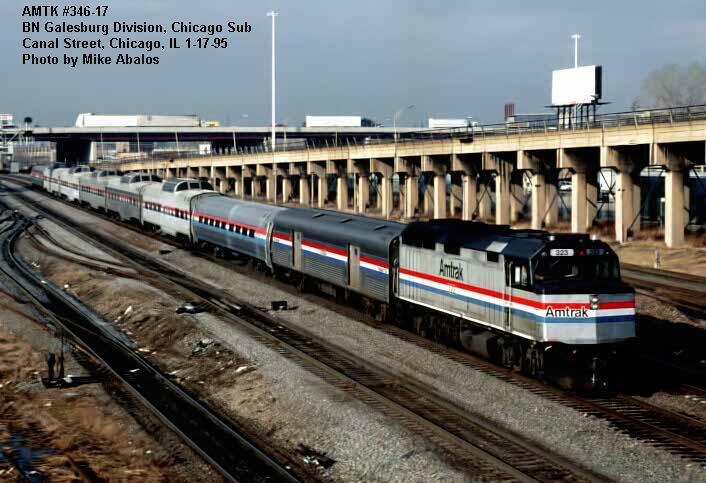 For even faster access, you can locate and link to the history and photos of any car by ORIGINAL NUMBER, by AMTRAK NUMBER, by AMTRAK "800xxx" MOVEMENT NUMBER, by 'SILVER' CAR NAME, by NON-'SILVER' NAME, or by LOCATION. Got a question and can't locate the info? Just send an e-mail and we'll be happy to help! Photos of the following cars are missing or poorly represented on the site - .jpg's, photos, slides, or even HINTS as to where a photo can be obtained would be greatly appreciated! (photos received in answer to this plea are noted in green). CBQ 252 "Silver Roundup" (burned 1970) 2/12/04 T Klinger/Dave Varilek (bless you-last car with no photo! Still with us? 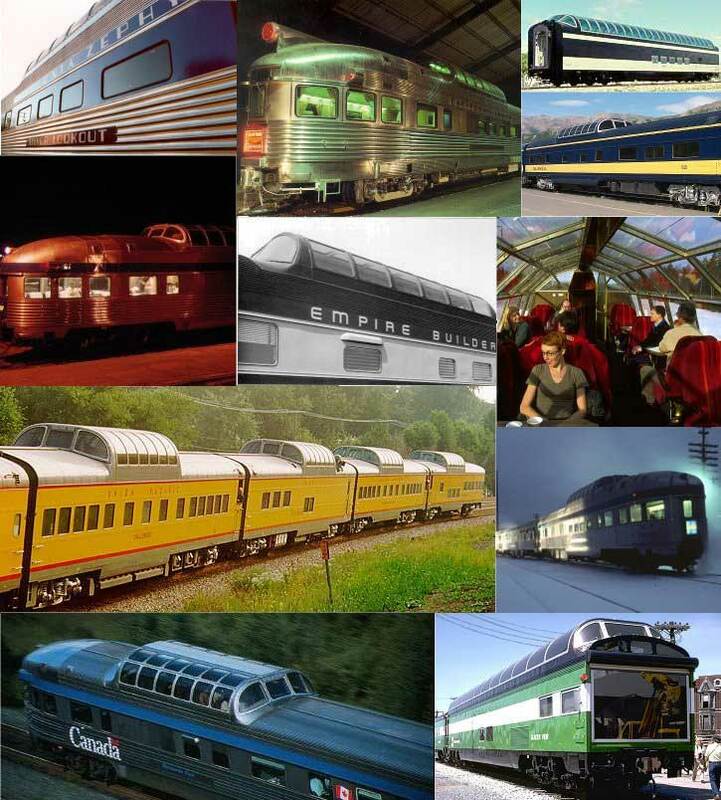 Then welcome to the history of railroad "dome" cars. Each section of this site contains historical information (and photo links as available) on a portion of the 237 original cars built in North America, broken out by the original owner of the cars. The format of this site was based on a spreadsheet compiled by Roy Wullich (rjwullich2_AT_aol.com) and then "fleshed out" with information gathered painstakingly over a number of years by Phil "Vista"Dohmen (bilevel400_AT_yahoo.com), the dedicated tracker of the lives of these beautiful cars. Research revealed dozens of errors in the data used to compile earlier publications on this subject, and this web site and possible upcoming publications will attempt to rectify those errors. Phil may someday do a publication (hardback, possibly paperback, maybe even just a "kinkos" bound copy) that continues the story of these cars with many details not previously known or shown in the brief summarys on this site. No date has been set to complete the effort. 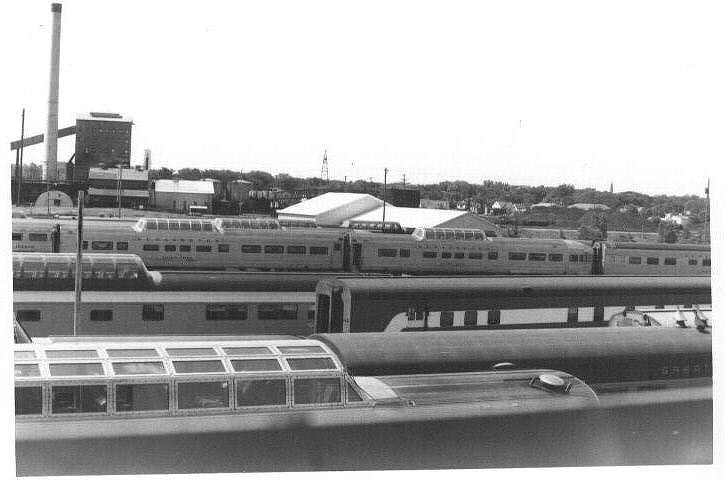 Additionally, Phil is also working on tracking ALL (approx 1250) of the "heritage" Amtrak cars into a 12 chapter book. 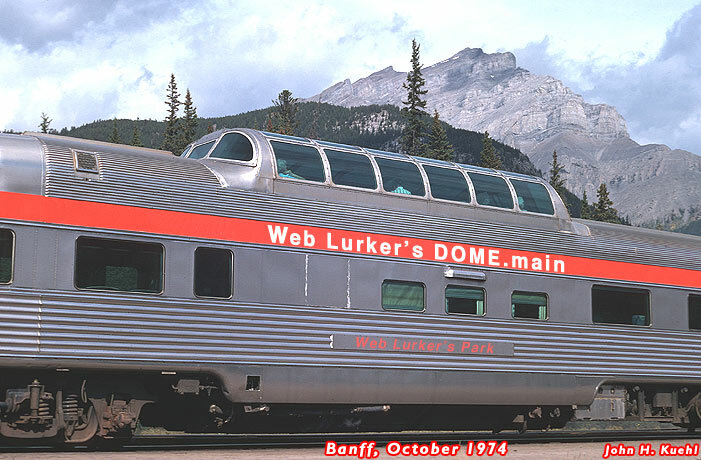 If you know the URL of any site that contains a picture of a dome car not shown herein, please nofity us so the picture can be linked to the appropriate page. 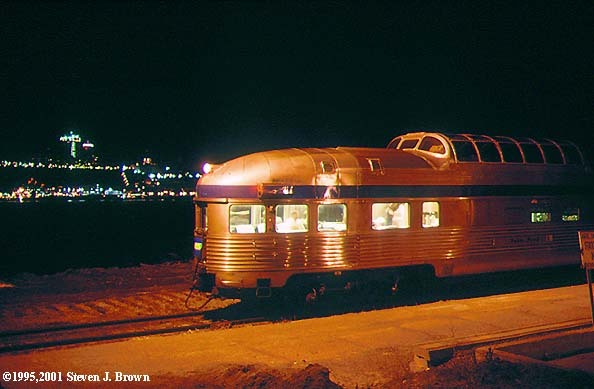 There are over 2,000 photos, with all 237 cars (last one located 2/12/04) photo identified. You might also like a quick look at some of the photos that we found that we considered "best" due to color, point of view, or other notable characteristics. Also, here's a great .gif display of virtually all of the dome/color combinations by Tom McCann. Note: every effort has been made to identify and give credit to the photographer on photos. If you notice an error, please notify us. Comments, criticism (never mind, forget that part - not allowed - an absolute NO-NO), questions and/or CORRECTIONS and UPDATES from anybody with any knowledge will be greatly appreciated. Please e-mail corrections / comments / whatever to the webmaster. Domes were built in two general styles, full or "3/4" (car-length) domes and short (center of the car). They are broken out in separate sections below, with a detailed history of each car. 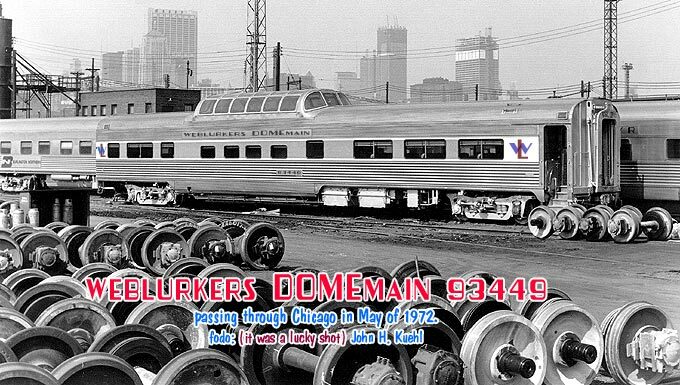 All 38 full size domes were basically designed to serve as lounges, while the short domes broke down as 87 coaches, 35 food service/lounges, 11 diners, 15 sleepers, 25 round-end sleeper-observations, 7 round-end lounge-observations, and 19 square-end lounge-observations. 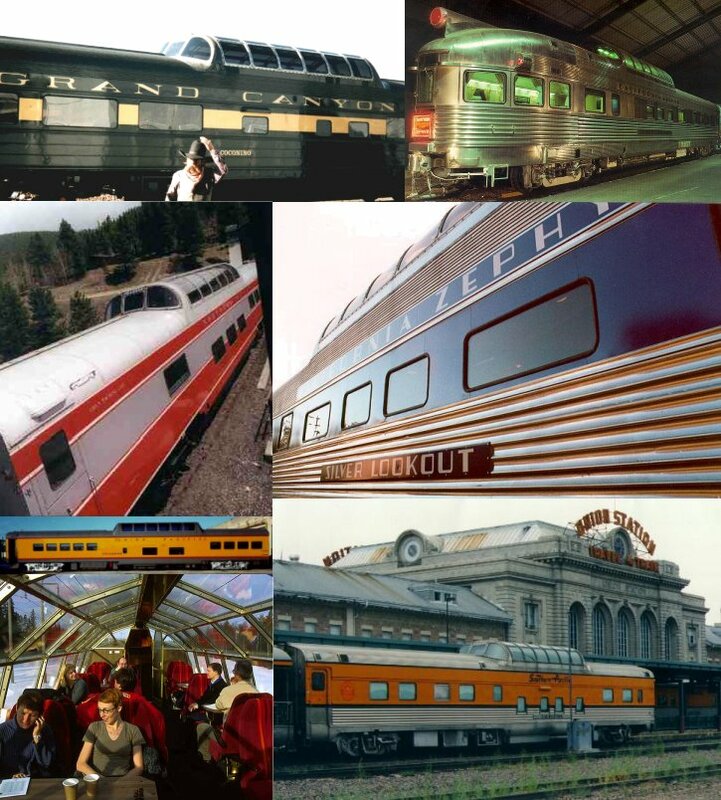 Also, several railroads "pooled" cars for trains (CB&Q and SP&S with GN on the "Empire Builder" and with NP on the "North Coast Limited" - IGN & T&P with MOPAC on various "Eagle" trains - Wabash with UP on the "City of St. Louis"). Cars are listed under both railroads if they were "pool" equipment. Next are "secondary" dome owners who purchased cars but were not original owners of "new" cars. If they had both, they are listed here followed by the name of the road they purchased from in brackets "". The "Amtrak" page also shows the current status of the car. And finally, a "catch-all" of cross-references, non-railroads, and other miscellany. Wonder where Amtrak got their cars? When they began in 1971, they purchased 1190 cars, including the domes (there were later purchases as well). Listed below are the railroads that furnished the original equipment. When a link becomes active, the cars will be listed for that road with original road number, builder, date, and Amtrak's number for the car. 1. Be railroad/railway oriented, either model or prototype. 2. Have an attractive overall appearance. 3. Be reasonably fast loading. 5. Be grammatically correct with no misspelled words. 6. Stimulate return visits and visitor feedback.